I purchased this to add to the car seat and my six month old likes it. This toys is a great distraction for him as he bites all over it, pulls and tugs and it definitely keeps him entertained during drives as he is not a car sleeper. My only concern is I am not sure how to wash it because the instructions states Not to immerse completely in water. Wow, so cute. The fox was bigger than I had imagined. 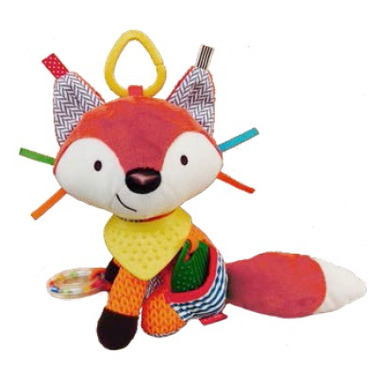 It was given as a baby shower gift to my niece, and foxes are one of her favourite animals, so she was also impressed with this toy and loved all it's features. Very cute toy! This seems well made and the materials look like they are of higher quality. My eight week old is just starting to interact with toys and he likes touching the different textures of this toy, especially the crinkly ears. I'm sure this will become a long-term favourite of my baby! Absolutely adorable! I love it and can't wait until my son is old enough to notice it and love it too!